At the dawning of the sixth millennium A.D. an Emperor has claimed the Phoenix Throne and united the Known Worlds following three decades of interstellar civil war. Still, the peace is precarious and many forces threaten the Empire: ambitious nobles fight to increase their power; greedy merchants grab for wealth; power-hungry priests dream of theocracy; foul antinomists traffic in dark powers; barbarian cultures stand poised to invade; resentful aliens seek revenge from millennia of human oppression; and countless others. The very suns themselves continue to fade, and few dare hope that the rising Phoenix can stem the tide of darkness. 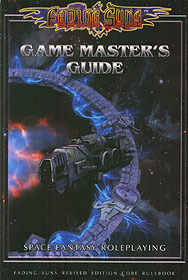 The Fading Suns Revised Game Master’s Guide contains the rules for adversaries, poisons, and hazards, as well as surveys of the Known Worlds, an introductory drama to kickstart a campaign, and much more!